1. 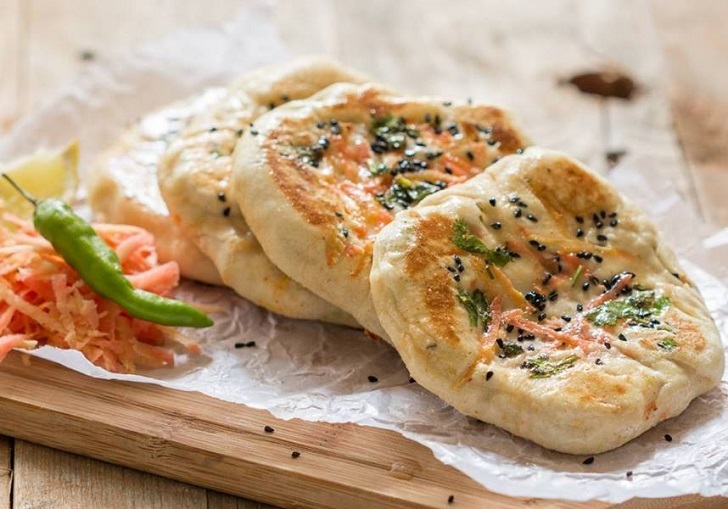 To begin making the Stuffed Vegetable Kulcha first mix together sooji and yogurt and set aside for ten minutes, in a large mixing bowl. 2. Once the sooji has soaked in the yogurt, add maida, oil, baking soda, sugar, and salt to it and knead together into a smooth. The dough should be firm and hold together, but supple and soft to touch. 3. Cover the dough with a lid and it in the refrigerator for two hours to leaven. 4. Meanwhile, prepare the stuffing. Place a pan on the heat and warm some oil in it. Add the chopped onions to it and saute along with the green chilies until the onions are softened and pale. 5. Add all the veggies, and sprinkle the turmeric powder, coriander powder, garam masala, and salt. Cook for five to seven minutes until the vegetables are cooked through and switch off the heat. 6. Place a skillet on the heat to pre-heat. Meanwhile, portion out the dough into golf ball sized pieces. 7. Working with one portion at a time, roll out the dough into a small circle about 2.5-3 inches in diameter. Take the rolled circle in your palm, place a spoonful of the vegetable filling in the center, while cupping it in your palm. 8. Bring all the edges of the circle together to seal the filling inside, like a tight pouch. Make sure there are no air pockets within. 9. Gently press the stuffed ball out once again slightly. Without adding too much flour, roll the kulcha out to a thick disc. 10. Next, sprinkle water on the kulcha, sprinkle kalonji and grated carrot and press down so it sticks. 11. Do not apply too much pressure at one place else the kulcha will tear and stuffing will come out. Kulchas are usually thicker than parathas. 12. Place the kulcha on the pan and cook until bubbles begin to appear on the surface. Apply a little oil on the top and flip the kulcha over to brown the other side. 13. Repeat, applying ghee, butter or oil and cooking the kulcha until it attains a nice even brown hue with some spots. 14. Serve hot along with Channa and Raita, or even plain with melted butter for breakfast. You could also pack it in a school lunch box along with a Paneer Curry.